Pocket-size camcorders have become very popular -- so easy to carry and simple to use, so you can bring them along to capture spontaneous moments that wouldn't be possible with larger camcorders. 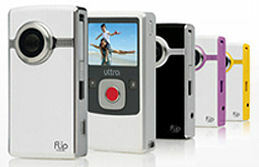 You can find pocket camcorders for around $80 to $100, and HD versions for around $150 to $220, with products like the Pure Digital Flip, RCA Small Wonder, Creative Vado, Kodak Zi6/Zx1, and Sony Webbie. These pocket camcorders share a similar design -- a rectangular box, held upright with the lens on the flat front and the display on the back. And they share a similar design philosophy, focused on making them dead easy to use by eliminating options and features -- including favorites like optical zoom, multiple video formats/resolutions, still photo mode, and nested menus of sometimes incomprehensible options. But sometimes it's handy to have at least some options, so these companies have introduced slightly more upscale versions of these products with various features including a flip-out display, video modes (SD, HD, and Web), photos with macro mode, and high-speed recording. The DXG camcorder line includes standard-definition and high-def camcorders, with models that shoot at the minimum 720p HD res (1280 x 720), at the lower 1080p horizontal resolution (1440 x 1080), and at full HD 1080p (1920 x 1080). In addition, DXG offers pairs of similar models in your choice of form factor: vertical (with the lens on the side and a flip-out display), and horizontal (like traditional camcorders). The vertical designs are around the size of some of the other pocket camcorders (though a bit thicker at around 4 x 2 3/4 x 1 1/2 inches, and 4 ounces), and the horizontal designs are a bit longer and thicker (around 8 ounces). Then DXG piles on advanced features found in higher-end camcorders, including the list above, plus digital voice recorder mode, internal storage plus SD card, NTSC and PAL video output plus composite or HDMI, an LED light for video and photo flash, and enhancement options (white balance, exposure compensation, color effects, and a self-timer) -- albeit not all these on all models. But we like our portable devices to be more than utilitarian -- as with cell phones, we want to make a statement with style and even fashion. So DXG offers a choice of bright colors (silver, black, blue, red, pink). And it is expanding further into lifestyle and fashion designs. The new DXG Luxe Collection, introduced this week, offers stylish designs to let you express your taste and personal style. The two models are the Riviera, with a quilted design in white, black, and pink, and the Soho, an argyle in blue and pink. These 720p HD camcorders have 128 MB internal memory and are priced at $149. Then for a more rugged design for active use, the DXG-125V All-Weather HD Camcorder is a splash and weather-resistant, with a rubber handgrip on the sides. It's a 720p HD camcorder with fewer options, a smaller 2" display, and lower-res photos, and is due out soon at $99. For swimming, snorkeling, and diving, the DXG-579VS Underwater Value Pack combines the DXG-579V camera with an underwater casing that is waterproof up to 15 feet, to protect from water, salt, sand, and elements. The case is rubberized to provide full access to the camera controls: Record, play, zoom, shoot video or still photos, use the underwater light. It's a 720p HD camcorder, priced at $149 with the waterproof casing. See full article, DXG HD Pocket Camcorders - Summer 2009, for more on the DXG product line and features. See my Digital Camcorders Gallery for more on pocket camcorders. Altec Lansing has a long history in advanced audio and, as a division of Plantronics, has expanded its consumer electronics line to include home audio and home theatre, computer speakers, docking audio for portable devices, and a broad line of earphones, including with mics and Bluetooth. 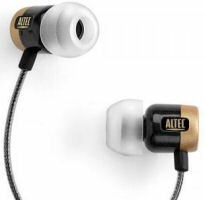 We tried out the Altec Lansing BackBeat Pro earphones, which are positioned as designed to satisfy the demands of studio engineers and professional musicians by providing high-definition audio in a small package, with superior noise isolation and exceptional comfort. They feature balanced armature micro-speakers, with up to 16 dB noise isolation and a frequency response of 20 Hz to 20 kHz. These Backbeat earphones include three sizes of neoprene ear tips (S, M, L) for your comfort fit. The Pro & Titanium add a fourth set of dual flange tips for extra noise reduction (with a double flange design). They also include a soft carry case. The BackBeat Pro earphones live up to the promise. They light and comfortable, with a 46" cord. The base was particularly explosive, and the sound was clean and punchy, with the kick drums coming through clearly. These are quite good earphones for $99, and even better for a street price of around $60. See the Portable Audio Accessories Gallery for more on earphones and headphones. Do you want to enhance video like on CSI, so you can read the writing on a shirt collar a block away in a camera phone video? Well not exactly, but more of this kind of technology from forensic video enchantment tools is becoming available in professional and even consumer video editing software, with auto enhancement and clean-up features as found in photo editing tools. But who wants to do video editing on a short clip from a cell phone or pocket camcorder? -- Today it's all about shooting and posting to share on the web. So MotionDSP, a developer of forensic technology for law enforcement, has released MotionDSP vReveal, $49 software for quick enhancement of consumer videos. With vReveal, just import your clip, select and preview the enhancements, and then save the result. It's made for quickly fixing up clips, without requiring firing up a full video editing application (although you still can trim the beginning and ends of clips). The interface is clean and simple, with a split-screen preview of the enhancements. Besides sharpening blurry clips, enhancing contrast, adjusting brightness (without blowing out the bright areas), and general cleaning of noisy video, vReveal adds two especially interesting options typically found only in pro software: super-resolution, to double the dimensions of a smaller clip with more detail from adjacent frames, and stabilization, to smooth out jitters from hand-held cameras. vReveal can process video files in MPG video and Windows formats (AVI, WMV), and more with QuickTime installed (MOV, MPEG 2, 3GP). You than can upload your video directly to YouTube, or save as a file, but only in WMV (Windows Media Video) or uncompressed AVI format. 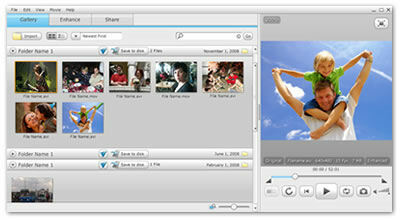 You'll then have to use a separate tool to convert clips to other popular formats for web, DVD, mobile, and other uses. vReveal is a nice quick path to cleaning up videos. But the real test is to try it out to see how it works with your own videos. You can download the free 30-day trial version, which applies a watermark to exported and captured videos. See my article, Summary: MotionDSP vReveal Video Enhancement Software for a tour of the software. Health insurance matters for your PC too. And it's not just about emergencies -- it's actually the preventative care and regular healthy practices that can avoid panic calls to the computer doctor. I'm often uninstalling and reinstalling new applications, so my systems are particularly susceptible to the cruft that Windows systems accumulate over time -- as the hard drive fills up with junk files, disk access slows down with files split up across multiple fragments, and more and more applications insert themselves as part of the start-up process to eat up the processor with background tasks. And even when I'm careful to properly uninstall old applications, it's still amazing so see the junk they leave around, including remnants of orphaned files, broken shortcuts, and unneeded entries in the Windows registry file. So I've been using iolo technologies System Mechanic as an all-in-one approach to keep my PCs under control, with system and security analysis, repair, and optimization (see previous post). iolo may not have the name of Symantec / Norton, but System Mechanic has been developed over 11 years, and iolo reports that it is currently the #1 best selling PC tune-up product in the US, Canada, UK, and France. System Mechanic version 9, released in July, enhances the tests (especially for Windows 7 and new Internet services), speeds up processing, and adds expanded Tune-up Definitions that are downloaded with product updates to further strengthen the testing. There's also a new EnergyBooster feature to temporarily boost your system performance by shutting down background processes; an integrated Total Registry Revitalizer to clean, compact, repair, and back up the registry; a PC Health Status Gadget for Windows 7 and Vista; and Incinerator features for file and Recycle Bin deletion with DoD security. System Mechanic has some 40 tools to fix, speed-up, and maintain PCs. It organizes these in an integrated console, so you can choose one of the integrated All-in-one Tools to find and fix system issues, or drill down to the Individual Tools to examine specific problems and customize the repairs. iolo is currently running deals on its website for System Mechanic 9 -- $49.95 list, $39.95 on the website, with annual renewals for $29.95, or $19.95 for a limited time. Even better, you don't need to buy multiple copies: one license can be installed on up to three machines. The subscription includes automatic upgrades for all version releases, not only minor upgrades, but also major new versions (like this version 9 for existing users). And iolo provides free, unlimited technical support and customer service. Interested? -- Download the demo version to try it out. Samsung is very serious about consumer electronics. It's no accident that you've been seeing more Samsung products in the stores, from mobile phones, to HDTV and home theatre, to cameras and camcorders, to computers and peripherals. At a press event in New Your City yesterday, Samsung gave some examples of impressive market share growth in the U.S. over the past few years: 15% to 39% in televisions, and 7% to 29% in home theatre. And then there's digital cameras and camcorders, where Samsung is getting serious as well, applying its strategy of combining striking design and new technology to develop interesting trend-leading products. Samsung has grown from 4% to 7% in the last year in digital cameras, and is looking to become a "tier 1 leader" in yet another market segment. 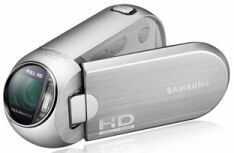 For example, the Samsung 2009 camcorder line (see my Camcorder Gallery) features a variety of highly portable models based on flash memory, including the flagship HMX-H100 line with internal Solid State Drive (SSD) recording. And the ultra-compact MMX-R10 (shown here) is only a half pound but still full HD resolution, with an interesting design that has the lens angled at 25 degrees, to hold more comfortably to reduce strain on the wrist. But the new announcement was about two new Samsung digital camera designs (see my Digital Cameras Galley) -- the Samsung DualView TL220 / TL225 with an additional small LCD display on the front of the camera for self-portraits, and the Samsung CL65 with full-out connectivity, including Wi-Fi, Bluetooth, DLNA, and GPS. Samsung explains DualView as part of the trend of sharing photos online and on social networks -- photographers are coming out from behind the camera to take headshots and to be part of the picture, capturing themselves as part of the scene that they are shooting. The image of the photographer is no longer crouching behind the viewfinder, but now the iconic pose is holding the camera at arms length to shoot the shooter. - Self Portrait mode to frame yourself in the scene without guessing. Just touch the screen to active. - Countdown Timer mode to set up the camera with the self-timer, displaying the numeric countdown. - Child Mode to play built-in animations on the front screen as a new approach to "watch the birdie," so kids might actually hold still for a second and be looking at the camera for a change. Both cameras are relatively small and light, even with 4.6X optical zoom. The TL220 with a 3" display is $299, and the TL225 with a larger 3.5" display and HDMI output is $349. 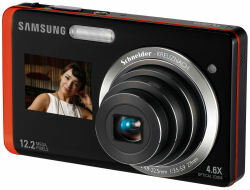 The connected Samsung CL65 digital camera is a similar size, with a 3.5" LCD and 5X optical zoom, and is priced at $399. - Wi-Fi to send photos wirelessly via email, or to upload directly to sites including Facebook, Picasa, and YouTube (use the touch-screen QWERTY keypad to enter network and site info as needed). - DLNA (Digital Living Network Alliance) to display from the camera over WiFi directly on your home TV display or other CE devices. - GPS to geo-tag your images to help organize them by location, and to link to maps on sites like Picasa. All three new cameras are due in September, and feature a touchscreen interface for easy menu access with haptic vibration response. They also have gesture input for some operations (scroll, rotate, delete), and a tilt sensor to select common commands. And they have oodles of "smart" digital camera technology, including Schneider-KREUZNACH lens, 12.2 megapixel sensor, dual image stabilization (optical and digital), smart auto modes, smart face detection / recognition, and smart album mode to organize images (favorite, face, color, content), plus H.264 (MPEG-4/AVC) video recording up to 720p HD. 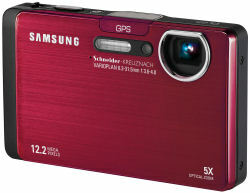 See my Digital Cameras Gallery for more on Samsung and other digital cameras. USB drives allow you to carry lots of data in a ridiculously small package, and at a wonderfully small price -- up to 8 GB for under $30. But the real value is in all that data -- personal or business, that would be inconvenient or painful to lose. Verbatim continues to bring out interesting options for USB drives to carry securely. The Verbatim Tuff-'N'-Tiny (previously Store 'n’ Go Micro) drives are ridiculously tiny -- half the size of a SD memory card. But they are built as a sealed, rugged package, which makes them easy to carry, either tucked away or attached with a lanyard to your keys (see previous post). Now there's the Verbatim TUFF-CLIP USB Drive, a larger design with an integrated carabineer clip that you can attach to a bag or a belt. These have rugged ABS plastic enclosure, with a retractable slider to protect the USB connector. Yet they are very light, at under 2 ounces. The Verbatim TUFF-CLIP USB Drive is available in turquoise with 4 GB for $29 (around $16 street), 8 GB in black for $49 ($25 street). Both these products include Windows security software that allow you to set up a password-protected private zone on the drive, plus a public zone for open sharing of non-sensitive content. So take your pick -- the amazingly small and light Tuff-'N'-Tiny to stash away, or the more substantial TUFF-CLIP that's easier to handle, and to keep track of, hanging on its clip. See my Portable Storage Gallery for more on memory cards and USB drives. Roxio Creator 2010 shipped today (press release). This is Roxio’s flagship suite of digital media applications -- Roxio describes it as the top selling multimedia software suite, with over 350 million copies shipped worldwide. It's a deep collection, with some 15 major applications to handle data, video, music, and images, plus some 20 additional Assistants and Express tools for specific dedicated tasks (see post on previous version). 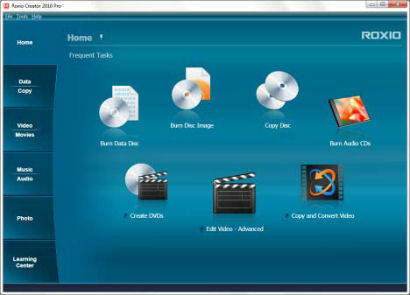 The Creator suite has a long history, from its beginnings with Easy CD Creator for data copying and disk burning, which expanded to Easy Media Creator with DVD, and now is plain Creator. Roxio is the consumer brand of Sonic Solutions, so the suite also includes Sonic's MyDVD for disc authoring and BackOnTrack for backup. Plus, the suite contains digital media editing tools for working with music, photos, and movies, built around a core of rather comprehensive applications including VideoWave and PhotoSuite (originally from MGI). Recent versions of the Creator suite have added more sharing options, from converting to portable devices and uploading online, plus support for high-definition video, especially though AVCHD camcorders and Blu-ray Disc drives. Creator 2010 continues the emphasis on consumer-friendly design, with an approachable and friendly design, a main Home / launcher application for quick access to tasks and creation tools, plus a new integrated Learning Center with video tutorials and how-to articles. Use the main application to access the right tool for the job: Capture and import video, audio, and photos, from analog and digital devices, including HD camcorders. Edit and transfer directly to CD, DVD, and Blu-ray, or convert to other formats. Create projects and compilations. Then Enjoy and share your movies, music, and photo mixes on disc, on your TV, online on YouTube, and on portable devices like the iPod. Key new features include Web video capture and conversion, graphics acceleration for fast video encoding especially for HD video, Blu-ray playback and on-disc editing, and Windows 7 support. Roxio Creator 2010 is priced at $99.99 ($79.99 with mail-in rebate, $59.99 upgrade). And to help convert your older tapes and other media, the Roxio Video Capture USB is a separate hardware device for $49.99 that is designed to work with Creator 2010 to capture older analog material and convert into digital formats. Entries posted to Manifest Tech Blog in August 2009, listed from oldest to newest.